Routing binding channels around a flat surface is a basic operation where a router cutter is guided around the target surface with an offset equal to the depth of the channel required. Either the cutter itself has a specifically-undersized guide bearing or the routing fixture holds the workpiece a set distance from the cutter. 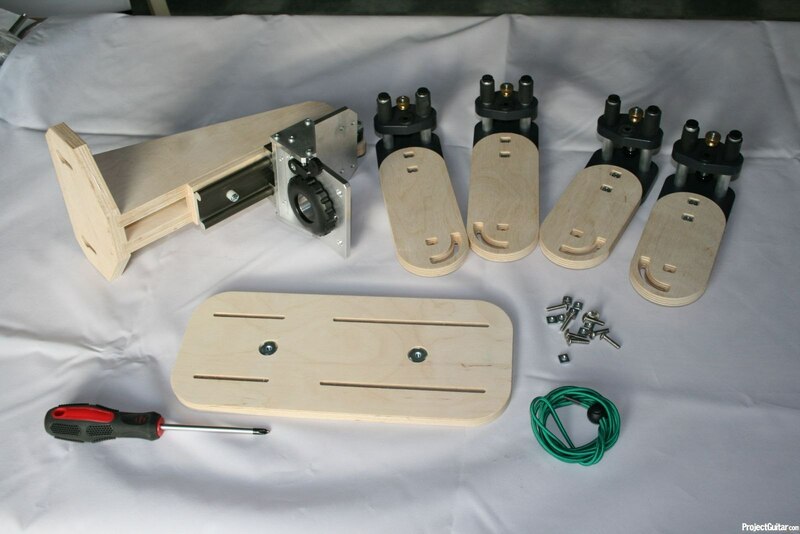 This operation can be carried out either using a hand router or a router table. Both systems have two major components. The router is held in a vertical caddy attached to a table. The caddy allows the router to float up and down over the workpiece using a guide bushing/collar situated around the exposed area of the cutter. This collar rides against the top of the workpiece to provide constant height of cut whilst the bearing on the router cutter is set for the required depth. A carrier holds the workpiece over the table top. This orients the body to keep the sides vertical; perpendicular to the cutter. In theory this allows rising/falling binding channels to be cut over forearm contours, into cutaways, around carved tops or any other shape without re-setting up any part of the system. 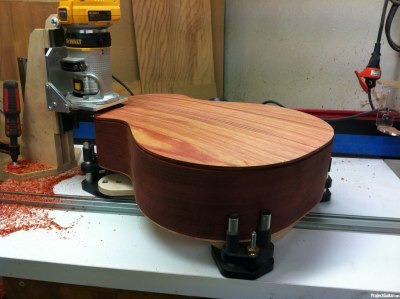 The Stewmac system requires a simple plywood body shape (either Stewmac's own or of your own design). Four aluminium and plastic L-brackets with a non-locking height adjuster and semi-permanently fixed to this base. Additional brackets are available if alternatively shaped carrier configurations are required. The LMI version is re-configurable and fully adjustable (at least, to some extent; more later) with longer travel in the adjustment system; in general it is a smarter solution. I decided on the LMI system for its sturdier build quality and its apparent ability to handle different (ie. with/without cutaways) or more radical body shapes and ordered it. Out of the box, the system needs minor assembly work. The router caddy itself comes fully assembled, leaving the carrier to be screwed together. Assembling the carrier is a pretty quick job, done in a few minutes. During assembly it was noticed that a few things could have been done in a better way. The square-nuts-in-square-holes could be upgraded with threaded bushings to make it a stronger and more foolproof system. When mounting a guitar into the carrier, I accidentally loosened one screw a tad too much and lost one of the nuts. Being an Imperial thread (Metric in Sweden) it was not a simple case of getting a new nut - I spent almost 20 minutes searching for the lost nut on my dusty workshop floor....so you have been warned! (I'm not sure if this is a comment on Metric/Imperial or dusty floors!!) I decided to secure the nuts in placed with a drop of superglue. The Neoprene rubber protective sleeves fitted to the upright posts on the travellers are a bit loose, thus it is possible for them to be misplaced also. These were also secured with a drop of superglue in the upper position. Maybe not the most elegant solution, but it works. I'm perhaps rushing ahead....back to first impressions! 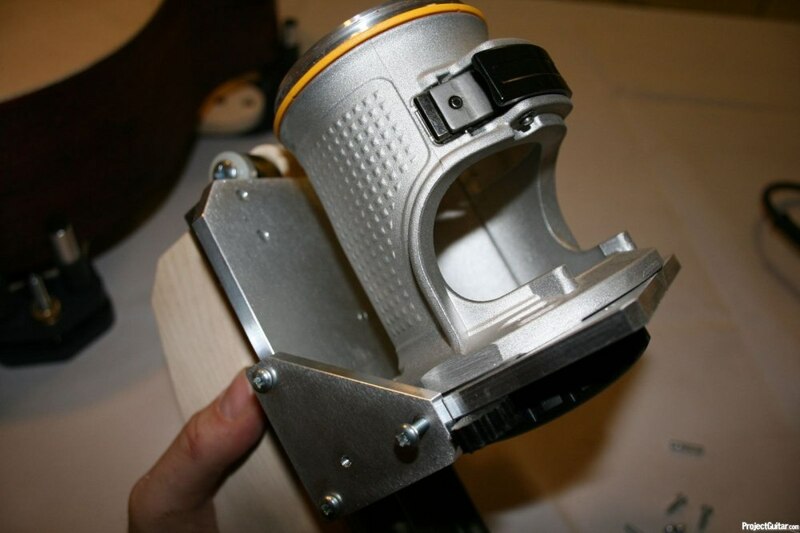 The fit of the parts is very tight, almost too tight; you have to push the screws through the holes. In my book that is not a bad thing. It just means that you will have a precision fit for a long time before the plywood wears and loosens. The assembly and user instruction videos on the LMI website are excellent. Only thing of note was neglected to be mentioned; the spring that pushes the thumb lock against the notched rub collar is not permanently attached which could possibly result in the spring getting lost. Other than that my wholehearted recommendation is to have a look at Brendan O'Briens videos explaining both the assembly and the use of the machine. My test object is a very small bodied alto-guitar, measuring 14” or 353mm across the lower bout and 18” or 457mm in length. That seems to be more or less the smallest body that can be used in the carrier. 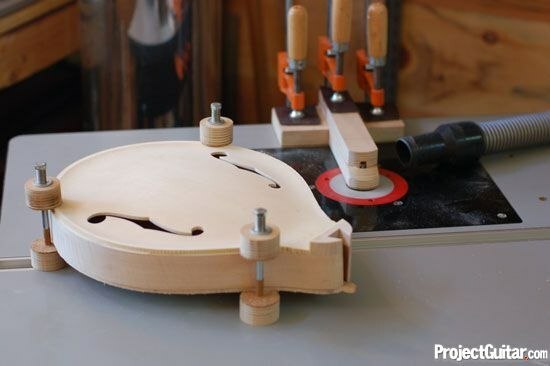 My test body worked, however smaller mandolin or ukulele-sized instruments will present a problem due to the minimum workpiece size the carrier can reliably hold. The binding caddy was clamped to the router table and the carrier assembled. Positioning the body steadily in the carrier, adjusting the router bit with the correct bearing and cutting depth was a very simple and quick job. In use it is probably the fastest binding job I have done so far on a non-flat guitar top; both sides were completed in less than five minutes. Comparing this to the old "doughnut and spacers" I used previously - cutting a small part of the binding channel and then repositioning the spacers several times - this is a breeze to use. 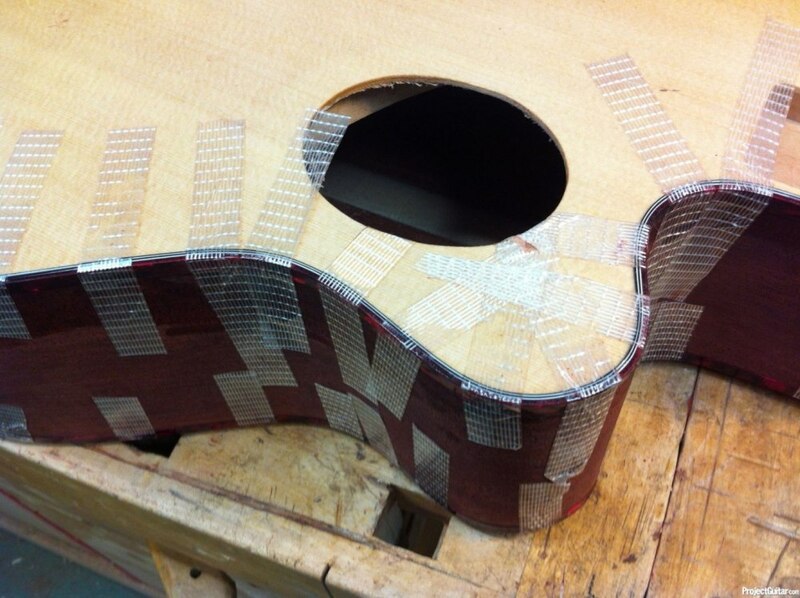 Sharp ledges routed, perpendicular to the sides of the body and no mishaps or difficulties whatsoever. The micro-adjustable rotating rub collar is really great to fine-tune the depth of the cut; I cannot stretch that part enough. With a .003” or 0.76mm adjustment for every notch in the rub collar I was given precision control of the cutting depth unlike anything I have used before. The only other system that can achieve this level of adjustability is a precision router lift in a router table; and they can only cut in one dimension! It is definitely a better idea than adjusting the cutting depth relying on the router itself. The carrier glides smoothly over most surfaces. It is worthwhile ensuring that your chosen surface is clean. Whilst I used the surface of my router table, a sheet of laminated plywood or particle board would also provide an excellent working area. The router lift mechanism smoothly moves up and down in the caddy to follow the slightest arch in the workpiece. Most importantly it keeps the cut of the router bit perfectly parallel to the sides. What I would like to see is an adjustable counter weight system to really tailor the movement/pressure against the top from the router. With my big DeWalt, the pressure against the top is just about acceptable; any more and I would be concerned about the rub collar might compress the surface fibres and leave a mark in softer woods - such as spruce - when it passes overhead. Two small things were noted in use. The bungee cord used to tighten the carrier assembly feels a little cheap. It works, however a slightly stronger and possibly more durable "long-term usage proof" solution would be excellent. Also - perhaps as optional parts or a kit - a smaller carrier base and/or shorter arms to allow smaller instruments to be processed would be very welcome. All in all - despite the inconsequential tiny quirks - it is in the end a solidly built tool that does exactly what it is supposed to do. It does so quickly and easily and is indeed a real time saver. In a busy shop or one where time is of high importance, that time saved directly translates through to money which more than offsets the initial investment. To the amateur or enthusiast, it transforms an otherwise complicated, slow and unpredictable task into a simple one with professional results - at a cost. One word: Expensive! However, if you are serious about your building quality and plan to make more than just one or two guitars, it's worth it. Perhaps not targeted at the newbie or the occasional hobbyist. There are much more affordable (primarily DIY) system out there for those who will do this job every second year or so. If you are a regular builder with high standards (or a hobbyist with deep pockets who doesn't settle for second best) then this is the tool for you without a doubt. Great, thorough and very helpful review. Thanks!